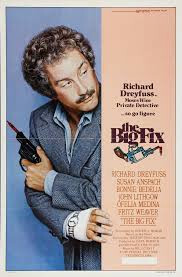 Advertising for The Big Fix (1978), Jeremy Paul Kagan's film starring Richard Dreyfuss, suggests some kind of lighthearted neo-noir, but the movie turns out to have more in common with Lawrence Kasdan's The Big Chill (1983) or even Sidney Lumet's underrated Running On Empty (1988) than, say, Robert Altman's The Long Goodbye (1973). Dreyfuss plays an L.A.-based private investigator, but the movie is less a private eye movie than about a former liberal activist that coincidentally happens to be one. All the genre conventions are present, but its screenplay mainly explores post-radical ‘60s malaise and Dreyfuss's character trying to come to terms with a world that has, in less than a decade, shrugged off so much of what once was so important. The film makes a few unfortunate compromises here and there, but it's also more directly political and personal than the overrated Big Chill, whose ultimate message seems to be: "Sure, we've all sold out, but so long as we feel a little guilty about and soothe our souls with a little Motown music, it's all good!" The Big Fix doesn't let its characters off so easily. Moses Wine (Dreyfuss), is a former ‘60s liberal activist from UC-Berkeley now working as a lowly private investigator. Recently divorced and perennially broke, he frequently looks after his two kids because his self-obsessed ex-wife, Suzanne (Bonnie Bedelia), is deep into New Age self-therapies with her current boyfriend, Randy Esterhaus (Ron Rifkin), a "Best" guru, an obvious reference to "est," Werner Erhard's Seminars Training, then in vogue. Moses is approached by Lila Shea (Susan Anspach), a former flame, the One That Got Away from his university days, with investigative work on behalf of drab California gubernatorial candidate Miles Hawthorne. As explained by campaign manager Sam Sebastian (John Lithgow), phony leaflets are mysteriously being distributed to conservative Orange County and elsewhere, allegedly from Howard Eppis, a longtime fugitive from the notorious "Underground" (i.e., the Weather Underground), a radical domestic terrorist organization, claiming to wholeheartedly back Hawthorne. As this "endorsement" would cripple Hawthorne's chances with conservative voters, Sebastian wants Moses to find out who's behind the libelous action, even if that means tracking down the elusive Eppis himself. Based on Roger L. Simon's same-named novel, the movie, co-produced by Dreyfuss, starts out as a moderately appealing Dreyfuss vehicle, playing to the actor's strengths and quirky screen persona established in big hits like Jaws and Close Encounters. After early scenes of Moses fighting with his ex, flirting with Lila, and playing with his kids, at just about the point the movie seems to establishe itself as mildly entertaining but inconsequential, a murder gets it back on track and moves The Big Fix in unexpected, rewarding directions. The personal tragedy Moses suffers jars him into some serious self-reflection, back to a more tumultuous time that, marked as it was by the Vietnam War, civil unrest, and the threat of imminent nuclear war, nevertheless offered validation of a kind. On one hand, his once-politically active wife has now become entirely selfish and money-driven, but his investigation, including interviewing political prisoners serving life sentences, serve to remind him of causes he once believed were worth fighting for. Moses hasn't sold out exactly, but lives in a kind of self-imposed exile, smoking weed from a bong and playing the board game Clue by himself, but he's no longer politically active but inert like Watanabe in Kurosawa's Ikiru, alive but not really living. The script, by author Simon, and Dreyfuss's performance add gravitas to the character. The murder that occurs about 40 minutes into the story upsets and unnerves him, and in a key scene, researching old footage of Eppis at a local television station, violent images of that time not so long ago literally move him to tears. One can read all the personal conflict in that performance, a testament to Dreyfuss's acting and Kagan's direction. One problem I had with The Big Fix is that it does for 1960s radicalism the same thing movies and TV used to (and still occasionally) do when characters infiltrate a fictitious Latin American or Iron Curtain countries, populated by characters obviously based on Fidel Castro or Khrushchev or whomever. Here, Howard Eppis is so obviously based on Abbie Hoffman that the actor playing him in flashbacks (F. Murray Abraham) is made up to look exactly like Hoffman, with Hoffman's mannerisms. EST is called "Best" for no clear reason, and the Chicago Seven prisoners are called something else. There might have been legal reasons prompting this, but it seems pointless not labeling things for what they're obviously masquerading as. Licensed from Universal, Twilight Time's Blu-ray of The Big Fix presents the film in its original 1.85:1 widescreen aspect ratio, the 1080p transfer looking very good throughout, as is the DTS-HD 1.0 Master Audio. Oddly, no subtitle options are provided on this region-free disc. Supplements are limited to a trailer (full-frame and in poor shape, typical of Universal titles), an isolated track of Bill Conti's erratic musical score, and liner notes by Julie Kirgo. Better and quite unlike what one might have anticipated, The Big Fix is a fascinating time capsule of both the time in which it was made and the time before that which it is so much about. Highly Recommended.